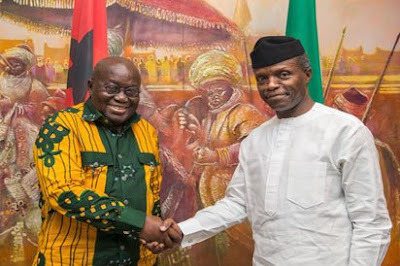 Acting President, Yemi Osinbajo on Sunday evening received President of Ghana, Nana Akufo-Addo, at Akinola Aguda House, his official residence. The two leaders highlighted the critical role that Nigeria and Ghana play as the “centrepiece” of ECOWAS and the West African sub-region. President Akufo-Addo thanked Acting President Osinbajo for receiving his delegation on a special day, when Nigeria was commemorating Eid El-Fitr. They discussed the forthcoming African Union (AU) Summit in Addis Ababa, ongoing negotiations on the Continental Free Trade Agreement (CFTA), and the revitalization of the Ghana-Nigeria Permanent Joint Commission for Cooperation. Both leaders pledged to intensify bilateral cooperation for the benefit and development of the sub-region. Members of the President Akufo-Addo’s delegation included Ghana’s Minister of Foreign Affairs, Shirley Ayorkor Botchway; Minister of National Security, Albert Kan Dapaah; and officials of the Foreign Ministry.